When you need garage door repair services you can count on, call the Garage Door Doctor! You use your garage door every time you leave or return to your home. If your garage door is operating at less than peak condition, it can not only cause a great inconvenience but can be a safety hazard for you and your family. Don’t risk getting stuck in inside your garage or risk the door malfunctioning and injuring you, your vehicle, or your family — contact the skilled garage door repair technicians at Garage Door Doctor in Indianapolis. At Garage Door Doctor, we have been providing high-quality garage door services to the residents of Indianapolis and the surrounding area for more than a decade and pride ourselves on offering functioning garage doors at an affordable price. We aren’t just any garage door company, we are your garage door company! When the safety of your family is on the line, you need a garage door repair team that you can trust. When you are searching for a garage door repair company near you, there are a few things to keep in mind. We are your local garage repair company who has been installing, repairing, and replacing garage doors and their components for more than a decade. At Garage Door Doctor, we are a family owned and operated company and we are your neighbors. When you need garage door repairs, you can trust our technicians. A company who offers the full range of services is more likely to be able to address all of your needs without having to subcontract and can do it at a reduced cost to you. At Garage Door Doctors, we do it all! Installing a garage door at your house is a big commitment. Not only will it provide a functional purpose in allowing easy access for you and your vehicle to enter your garage, but it plays a big part in the curb appeal of your home. Whether you are building a new home, adding a new garage, or simply want to replace or upgrade your current residential garage door, you can find everything you need at the Garage Door Doctor. We carry and install all styles of Haas Door and C.H.I. Doors. If you are not sure what you want or if the overhead garage door that you like will work with your garage, contact our garage door experts for a free evaluation and estimate. When it comes to installing commercial garage doors, a sub-par installation job will not do. When your business is counting on it, every minute you waste battling with a poorly operating garage door means potential customers finding a different company for their services, which means money out your door. When you have commercial garage doors installed, you need quality hardware and installation services that will allow your commercial garage door to withstand the stressors of daily operation and the environment. At Garage Door Doctor, we have been installing commercial doors for the businesses in Indianapolis for more than a decade! We have the skills and experience it takes to expertly install, repair, or replace your industrial or commercial overhead garage doors. We carry and install all styles of Haas Door and C.H.I. Doors. If you need a commercial garage door installed contact our garage door experts for a free evaluation and estimate. 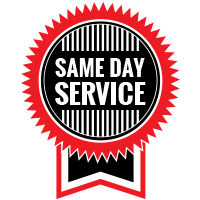 A broken or damaged garage door is inconvenient, no matter when it happens, but when your garage door is experiencing issues, it is undoubtedly outside of “normal business hours.” The good news is that at Garage Door Doctor, our normal business hours are whenever you need us! 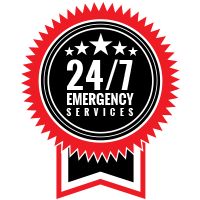 We have experienced garage door repair technicians on-call to help you with your garage door emergency 24-hours a day, seven days a week. A broken garage door can result from a number of insults and can cause serious safety concerns. Whether your garage door is stuck open or closed, or is trapping your vehicle in a collapse, this alters your ability to leave or access your house and can leave you vulnerable to theft or environmental damage. In cases like this, you need garage door repair services right away. There is no job too big or too small for us to get fixed when you need it! Of course, when you call our emergency garage door repair team, we will offer an obligation-free estimate before heading out to repair your garage door. Some garage door emergencies are not preventable — tree falls, structure collapse, and vehicle collision (some of these may be avoidable, but have little to do with the garage door itself). However, the majority of emergencies can be prevented. If you are not sure how to do any of these preventative maintenance measures, enlist the help of our garage door repair technicians. And, if you are currently experiencing a garage door emergency, contact us to get the repair services you need right now! Residential garage doors are more than just an entryway for your vehicle’s storage room. Your garage is undoubtedly a storage space and allows entry to your house. And, most importantly, the garage door is often the face of your home — the largest and most prominent forward-facing portion of your home. If your overhead garage door is worn and struggling to work, garage door repairs are in order. Additionally, if you have a manual door, it may be time to install a motor, remote control, and safety sensors. Commercial garage doors are the entryway to the businesses they protect. When damage or poor performance limits the functioning of the commercial overhead garage door, it can have a significant negative impact on daily operations and profits. You need a commercial garage door repair company you can trust to get your garage door, and your business, back on track. At Garage Door Doctor, our skilled garage door repair technicians are equipped to handle any garage door repair, even the complex commercial or industrial doors at warehouses, municipal buildings, fire stations, auto repair shops, loading docks, shipping and receiving areas, factories, storage facilities, restaurants, car dealerships, and so much more. Garage door springs offset the weight of the garage door, which allows them to open and close easily. Garage door springs are rated by uses, such as “10,000-use.” This number is the estimated number of times the garage door can be opened before the spring wears out and will no longer support the weight of the door as well. 10,000 times may seem extremely high, like you may never have to worry about replacing them, but if you consider the fact that residential garage doors are typically opened 4 to 5 times a day and commercial garage doors can easily double or triple that count, even the most conservative homeowner can expect about five years of peak performance from their garage door springs. This also means that garage doors that are opened more frequently or are misused, will obviously mean it will wear out much sooner. Garage door springs are available in two types — torsion and extension. Torsion springs are mounted on metal rods that run parallel to the garage door. Torsion springs are tensioned with a twisting action. When the garage door is open, the spring unwinds to help lift the door. Extension springs are those that run perpendicular to the door, mounted above the door tracks. These springs are stretched, using cables and pulleys that provide the tension. Extension springs are equipped with a safety cable to prevent the door from falling in the event of a spring break. When was the last time the spring was repaired or replaced? How often do you open and close your garage door? Is there visible wear and tear? Garage door springs should be replaced, both sides at the same time, regularly. For safety’s sake, this task should be left to the garage door repair experts. If you are concerned about your residential or commercial garage door torsion or extension springs, contact us to have them inspected, repaired, or replaced today! Garage door openers, while not absolutely necessary for the functioning of garage doors, offer much more than ease of opening, but also provide safety. Garage doors are heavy and can cause some issues when the garage door cannot be opened all the way. Automatic garage door openers allow the owner to stay safely inside their vehicle while the garage door opens and closes, out of the elements and less vulnerable to those with ill intentions. If you need any work done on your automatic garage door opener, it is best to hire a trusted local garage door repair company. Mounting garage door openers involve a firm understanding of the structure of your garage framework and electricity. Garage door and garage door opener installment, repair, and replacement are not the safest home improvement tasks. Play it safe and give us a call today!